Patient Safe® syringes are uniquely designed to reduce the risk of bloodstream infections resulting from catheter hub contamination. 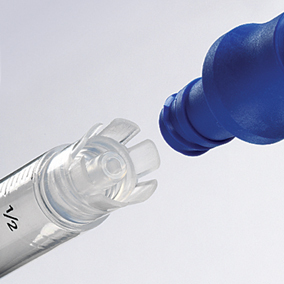 Their unique luer guard reduces the risk of luer tip contact contamination. It also reduces the risk of contamination of intravenous fluid. Patient Safe® syringes are compatible with most available hypodermic needles, including those with manually activated safety features, vial access devices, and luer-activated catheter hubs. 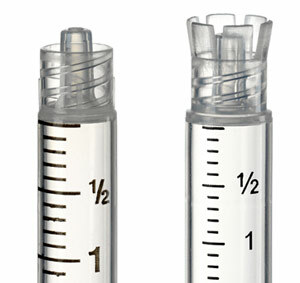 Unique luer guard promotes safe handling of patient safety syringes and medication. Reduces the risk of luer tip contact contamination and medication contamination. Reduces the risk of healthcare worker exposure to hazardous drugs during reconstitution, preparation, transport, and disposal. Compatible with most available hypodermic needles, including those with manually activated safety features, vial access devices, and luer-activated catheter hubs.